Thanks to the influence of the Hui ethnic minority, dishes in Gansu revolve around roasting, steaming, and braising beef or mutton, with very little consumption of pork or chicken. 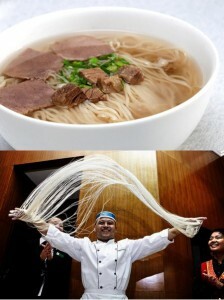 Since the Hui people are Muslim, they are prohibited from eating pork, and the cold weather in northern China has given the locals a fondness for hearty red meat over white meat. A range of seasonings are also employed in Gansu cuisine, with a preference for salty and spicy flavours. 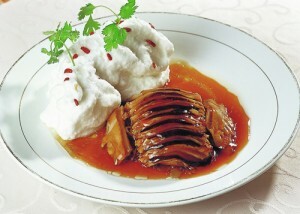 Gansu-style dishes tend to be very fatty, oily, and rich, so be prepared to put on a few pounds during your travels! This sumptuous noodle dish is certainly the most famous in the city of Lanzhou and arguably the most renowned in the whole province. The recipe emerged during the Qing Dynasty (1644-1912) and was masterminded by a humble, elderly Hui man named Ma Baozi. The noodles are dexterously pulled by hand in a matter of minutes before being quickly boiled and then covered in a clear, flavourful soup. They are then garnished with tender slices of beef, fragrant coriander, green garlic, crunchy white radish slices, and some red peppers to give them a spicy kick. According to tradition, boys, farmers, and workers are meant to have wider noodles, known as erxi, while girls, elderly people, and scholars tend to prefer slim ones, known as maoxi. These stereotypes have become so entrenched that the noodles have gone beyond being simply a signature dish and are now part of the local culture. So be sure to use your noodle and pick the right noodles for you! This dish is popular with several of China’s Muslim ethnic minorities in Xinjiang and Ningxia, but the “Grabbing Mutton” from Linxia County in Gansu is considered one of the best. Its name derives from the fact that historically it was sold on the street and, in order to eat it on the go, people would simply “grab” a piece of the mutton with their hands. That being said, be sure to pay for it first! To make the dish, a joint of mutton is first stewed for a long time, until it becomes so tender that the chops can be easily separated and the meat melts off the bone. Dunhuang was once a focal oasis town along the ancient Silk Road and, when it came to traversing the desert and pulling the merchant caravans, camels were the animal of choice. Camels were such valuable pack-animals that they were never killed for their meat, so this dish could only be made using the meat from a camel that had died of natural causes. Since camels can live for upwards of 40 to 50 years, you might be waiting quite some time to sample this tasty signature dish! The rarity of the meat means it’s a real luxury item and this will be reflected in its price. The dish rose to popularity as one of the favourites of Yang Yuhuan, an imperial concubine to Emperor Xuanzong of the Tang Dynasty (618-907). 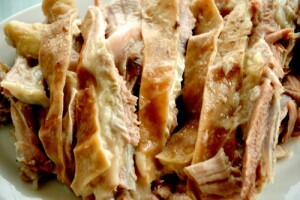 It’s made using the fatty meat of the camel’s hump, which is diced and stir-fried along with shredded leek shoots, dry bamboo shoots, mushrooms, ham, and chicken breast. The soft, fatty meat of the hump is considered particularly delicious, and has been a staple part of signature dishes in Dunhuang for over 1,500 years. Like Stir-Fried Hump with Five Shredded Toppings, this dish can only be made from the meat of a camel that has died naturally and is thus considered a luxury dish. Don’t let the name fool you; the dish is made from the camel’s tendon and not its hoof, so there’ll be no need to invest in a set of dentures after you’ve eaten it! The name of the dish and its distinctive appearance derive from the camel’s historical importance to the Silk Road. The tendon is steamed along with a whole chicken for approximately 7 to 8 hours, until the meat is soft and the bones can be easily removed. The meat is then sliced and moulded into the shape of a camel’s hoof. Finally egg white is whipped, cooked, and moulded to resemble a snowy mountain. The whole effect is designed to replicate how the camel’s hoof-prints would have looked as they traversed the snowy Qilian Mountains, which made up part of the Silk Road.